Fytch & Captain Crunch brings us some heavy hitting unique sounding massive drops in the banging dubstep genre. Get some sweet vocals from Carmen Forbes and you've got yourself something special. Both the original and the Tomba remix are free downloads, Check em out. Yet let me obtain my wish. Following! This is really frigging good. Starts out like a normal song, all calm and nice. Kinda hints at it being a bit electro. And then BAM. BASS DROP! AWESOMENESS! Ah yeah. I wish I had my 400 watt RMS sound system right now. These are very appropriate, as it's now raining outside. Thanks for being clairvoyant. Yes. The second one, anyway. Don't know about the first, I guess when there's decent female vocals I expect a better drop or something. I'm spoiled. But the second track was an improvement. Don't get me wrong, I'm getting them both. I just like the second way better. I liked the original mix better. Thanks for sharing! Great music! Second one is awesome! I prefer Tomba's faster stuff but this was pretty sick, thanks for sharing. Great music. Thanks for stopping by my blog today. Those are really amazing songs! Some great dubstep tracks you've got there. she has a nice voice, but i'm not sure if i could listen to this kinda music all the time. This has absolutely nothing to do with dubstep. This is like looking at a piece of cake and calling it an elephant. Just no correlation at all. That is a lovely voice she has there. Your comment confuses me :( Did you listen to the song? 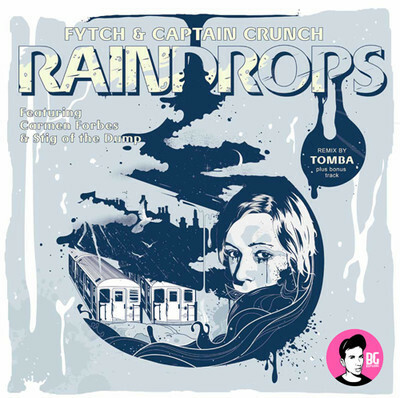 'Raindrops' about as dubstep as it gets. Reminds me of Flux Pavilion actually. Yep, listened to as much as I could. No problem with the music in of itself, it is not my thing but whatevers, but that bears no relationship whatsoever to dubstep. For no good reason, felt like pointing that out. Love the vocals. That chick's voice is yummy man. Good lord, this is great. I never thought I'd be getting into dubstep...but songs like this make it hard to deny my love for the wobble.